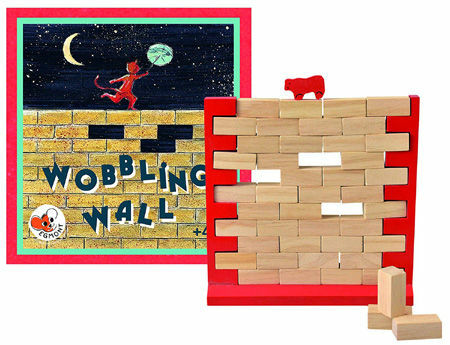 Wooden Wobbling Wall Game is a game of balance and skill as you try to remove wooden bricks from a stacked wall without causing it to collapse and make the sheep fall. A wonderfully simple wooden toy which is fun for kids of all ages. The game comes with a sturdy red wooden frame into which the 44 wooden bricks are stacked one on top of the other, just like a brick wall. The little red sheep is balanced on top. Very carefully you take turns to remove bricks one by one without making the sheep fall. This is a great game for multiple players or you can play it by yourself. The manufacturer Egmont Toys are a Belgian brand. The development and design is done in Belgium, mostly by their in-house designer Gaëtane Lannoy. Material: Wood, Child-safe paint, . We like this because: "Great to play alone or with others wonderful for fine motor skills... fun!"